Honda Motor Co., Ltd. announced today its new "Human Friendly Transmission" (HFT) destined to become the new power delivery mechanism for its future motorcycles. 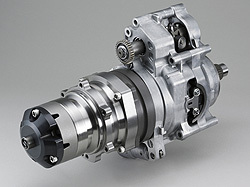 It's described as an automatic transmission for motorcycles. Already, they announced it will be used in the DN-01 motorcycle that they plan to produce soon.